Our man Jimmy surfaces, with lunch in hand. Seated or standing, the helm offers a good view. The cuddy cabin is great for the kids or for storage. It has plenty of natural light. Jimmy did a great job providing lunch. The day didn't remain sunny and 10kts for long but the Fyran 550 took it all in its stride. I still fondly remember the first time my old man let me and a couple of teenage mates head out for a day’s fishing in a Fyran 12ft dinghy. That first taste of the ultimate feeling of freedom that a boat, a full tank of gas, a few rods and a good view affords is hard to forget. Fyran is a name that needs no introduction in New Zealand waters, with the brand being afloat since 1969, and it’s about to surface in Australia. The company is still producing its beloved 12ft tinny, but the introduction of new 3D modelling software and beefed up construction means the new Fyran 550 is more than capable of offering plenty of adventure opportunities for the big kids amongst us, while allowing the family to enjoy quality time on the water as well. Fyran’s growth into an expanded range coincides with that export push into Australia. Watch the Fyran Boats 550 video. Instead of forfeiting a fishable cockpit to longer bunks that you’ll probably never overnight in, the Fyran 550 cuddy cabin is still a great place to store the gear while allowing the kids to have a sleep on the way home. For increased peace of mind, the area under the berths is foam-filled, forgoing under-berth storage, but safety-first is far more beneficial. 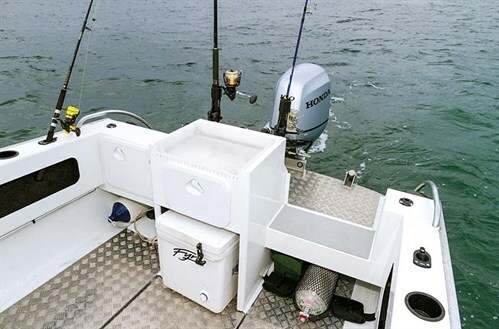 The generous 2.2m beam and soft-rider pedestal seats leave plenty of cockpit scope for a fishing trip with the boys or teaching the offspring to catch their own dinner. There’s also ample real estate for king/queen helm seats to increase the seating capacity and family usability. Strategically placed Tallon receivers (with rodholder attachments fitted) allow for the lure spread to be fine-tuned for trolling or a multitude of attachments to be plugged in to suit the occasion. The integrated baitstation comes complete with measuring notches, a removable baitboard and an optional tackle drawer to keep the terminal tackle on hand. A 55lt Icey-Tek cool-box is neatly stowed below to chill the catch. Speaking of chilling, the soft-rider pedestal seats do a 180-degree turn, affording a comfortable seat to drop a line, with rodholders and drink/sinker holders close to hand. When the boat review date for the Fyran 550 was booked the forecast read 10kts, variable and sunny – perfect for a fish and dive adventure. However, it quickly became apparent at the ramp that this wasn’t going to be the case. Despite the building sou’easter and ominous grey clouds rolling in, the prospect of succulent scallops far outweighed the likelihood of wind chill, rain and a few waves ruining our fun. With the Fyran 550 loaded to real world standards we plotted a 25nm round course for Auckland’s most well-known scallop bed in the hope that the spring winds and less than balmy water temps would mean we’d still be able to grab a feed. A full load, building front quarter sea, and a soon to be opposing tide would mean the Fyran 550 would have its work cut out on this occasion. Once at our dive spot the anchor was deployed via the large front hatch while our brave diver Jimmy geared up to test the stability, Portofino transom and dive ladder functionality. The stability, walkthrough transom and solid T-style dive ladder proved their worth, as did Jimmy’s dive skills. With him back onboard, just enough scallops for a tasty entrée and sun setting we pulled the pick and fired up the Honda for the run home. The wind-against-tide effect was in full force through the channels, but a full load of blokes and heavy dive gear proved no issue for the robust hull and the quiet achiever, pushing us along at up to 32kts. When it comes to getting out of the hole, the maximum rated 100hp outboard motor, Honda’s BLAST technology and the Fyran 550’s variable deadrise hull (24-degrees amidships to 16-degrees at the transom) was a match made in heaven. The slippery hull stays on the plane to just under 10kts which, when combined with the hydraulic steering, provides a reassuring drive in challenging conditions. Don’t be fooled by its easy-going attitude however, as when given plenty of throttle it also turns hard and fast without any hint of cavitation. The good windscreen height (with complementary grabrail) allows either an unobstructed stand-up view with the wind in your hair or a sit-down, sheltered outlook. Without a bimini top or clears fitted we copped a few salt-laden showers through the snottiest parts, but overall the boat was pleasantly dry given the rubbish conditions. 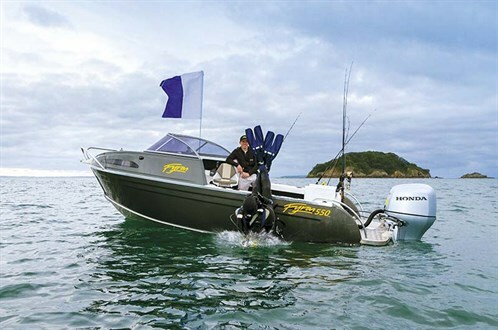 With the 100hp Honda four-stroke, 4mm aluminium hull, 3mm topsides and Fyran’s solid new construction techniques it also proved to be the strong, quiet type out on the water. Spring winds and sloppy conditions couldn’t put a dampener on an enjoyable afternoon on the water, which is what this boat is all about – getting away from it all and having an adventure in relative safety and comfort without breaking the bank. 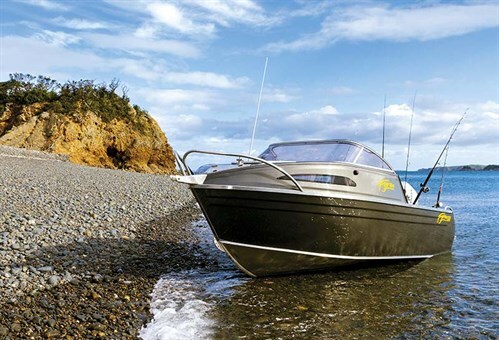 CPC-rated and built tough, it’s a kiwi-made value for money fishing boat and family fun boat with quality that defies its price tag. 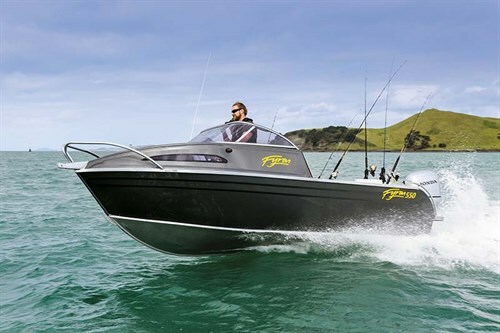 With the Fyran boat brand’s recent focus on finish and enhancement in build quality it’s certainly a leap in the right direction for one of New Zealand’s most recognisable and longstanding boat manufacturers. With the company now actively seeking Australian representation, it won’t be too long before the Fyran name becomes a regular sight on Australian waters. See the full version of this review in Trade-A-Boat #247, November / December 2014. Why not subscribe today? Single Honda 100hp four-stroke outboard motor with 17p propeller. * Sea-trial data supplied by Honda Marine. Grabrail, Fusion stereo, VHF, hydraulic steering, soft-rider pedestals, full paint, 55l Icey Tek cool box, integrated tackle box on baitstation and lower side pocket liner.